This 30 year old chance C. japonica seedling first bloomed in 1985. 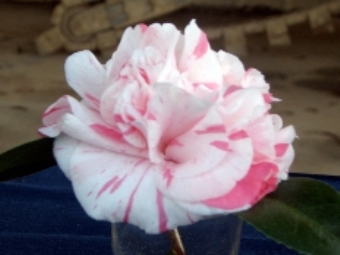 The 3.5" peony-form flowers are white with flecks, streaks and petals of dark coral pink. Anthers have a yellow tint and filaments are yellow. It is a profuse bloomer. The flowers fall in one piece and are consistent in form. It is suitable for exhibition. It won Best Seedling in the Pensacola Show in 2006. Plant is upright/spreading with dense growth and average growth rate. It has landscape potential. Dark green leaves 4" by 2.25".